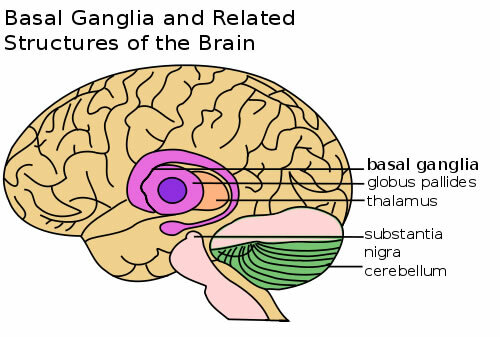 A study conducted by researchers at Emory indicates that inflammation targets a part of the brain called the basal ganglia (see illustration below), causing symptoms of depression and fatigue. The study was recently reported in the October edition of Archives of General Psychiatry. These findings also help explain the connection between inflammation and depression because alterations in basal ganglia function are reliably found in depressed individuals. "The basal ganglia are responsible for getting us motivated and moving," says Andrew H. Miller, MD, senior author for the study and professor of Psychiatry and Behavioral Sciences at Emory University School of Medicine. "When inflammation is excessive or persistent, it can lead to chronic changes in behavior, including feeling run down and apathetic. These symptoms are classic for the basal ganglia." The study used brain imaging to examine people receiving the inflammation-causing drug interferon-alpha for the treatment of hepatitis C. Many individuals who receive interferon-alpha for hepatitis C therapy become depressed, and this was one of the first clues that inflammation may cause depression. The investigators also found that the major chemical that drives the basal ganglia, called dopamine, was disrupted by inflammation. In fact, according to Miller "the brain acted as if it was starved for dopamine." Dopamine is the chemical released when we experience something that makes us happy or excited, and a decrease in dopamine can lead to depression. Further research on how inflammation leads to impaired dopamine function may lead to new treatments for depression and fatigue in individuals with high inflammation.